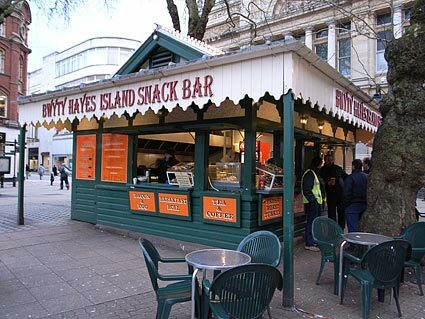 Cardiff's 'Parisian-style' al fresco dining experience. 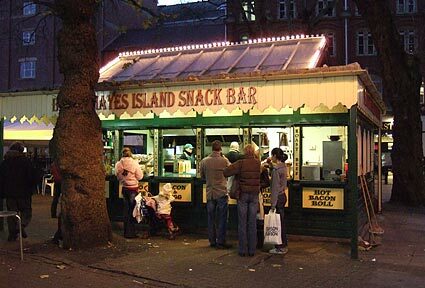 Conveniently close to the adjacent underground mens toilet (perhaps a little too close in the summer when musty aromas arise from the depths) and right next to the Cardiff Visitor Centre and St Davids Concert Hall, Hayes Island Snack Bar is a Cardiff institution. 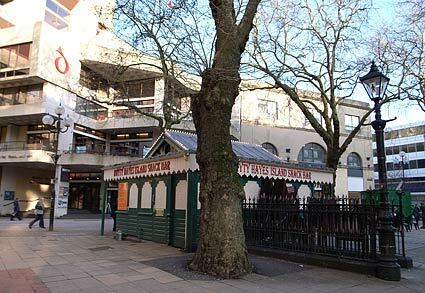 Starting life as a parcels office for Cardiff Corporation Tramways in 1911, the wooden structure in Victoria Place was converted to a snack bar back in the mists of time and continues to prosper, despite the inevitable closure threats. 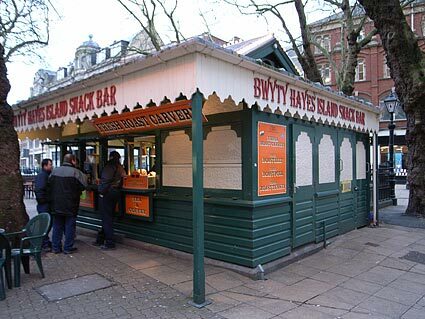 Visitors can enjoy a good range of snacks, hot food and hot drinks from the railway station-like building and settle down to watch life passing by. 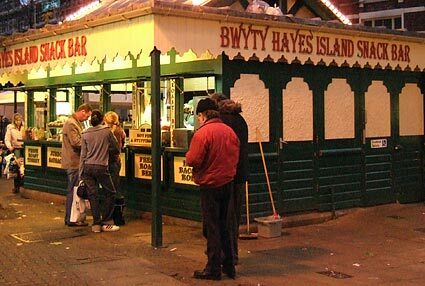 A wet afternoon at the snack bar, January, 2001. 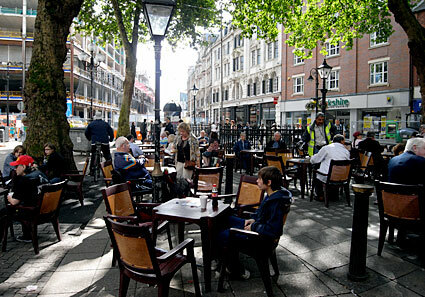 The adjacent trees sadly provide a perfect platform for pigeons, so keep an eye out for wet droppings! 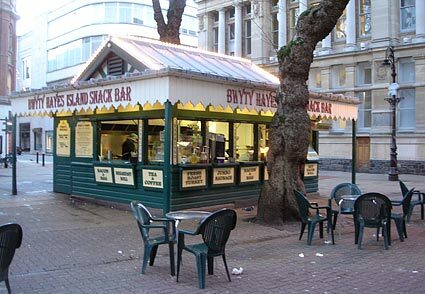 Deserted snack bar, Boxing Day, 2004. Early evening view, December 2005. 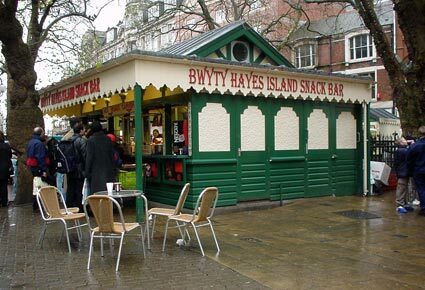 'Bwyty' means 'cafe' in Welsh. January 2007. 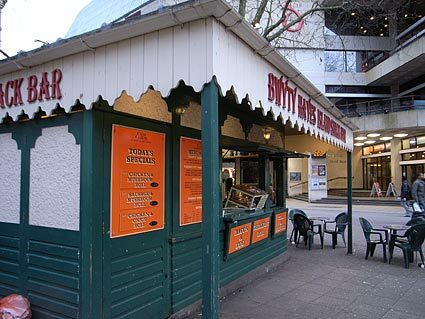 The sign advertises Hot Chicken and Mushroom rolls at £3, tea 60p and coffee 90p. Directly behind is the towering edifice of the St David's Centre. 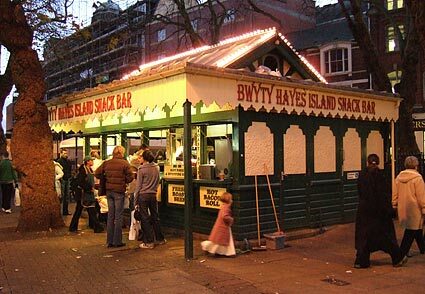 Cardiff al fresco style! 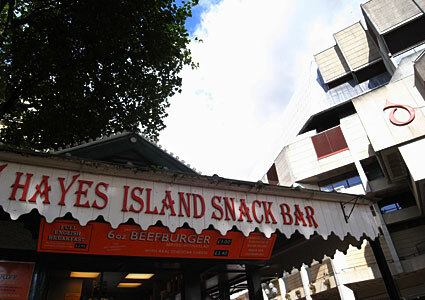 September 2008.